Five Makeover Credits, which can be used in-game to change the hair style, hair color, face, skin color, and body scale of a character. This service lets you customize your character's appearance (hair style, hair color, face, skin color, and body scale). Please note that this item includes 5 Makeover Credits, which you may use on a single character or across multiple characters on the same account. How to redeem -Anatomical Engineer Llye [Stylist] in the Great Temple of Balthazar, located on the Battle Isles. There you may preview your available options for alternate aesthetic features, including hair style, hair color, face, skin color, and body scale. Changes to gender are not included in this pack. 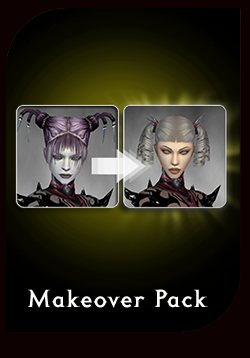 This item includes five Makeover Credits, which may be used on a single character or across multiple characters on the same account.